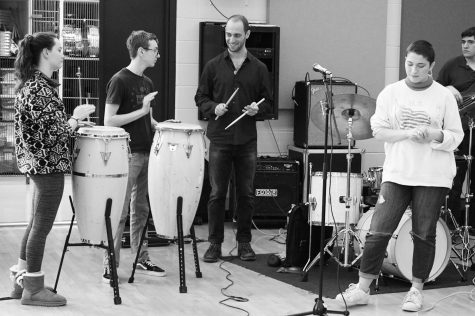 Alumnus Michael Hojnacki (‘12) (center right) talks to percussionists during a master class for music students on Jan. 31 Hojnacki was in Glenbrook North bands and now plays drums for Singer Bianca Muniz. During his years at Glenbrook North, he was involved in band, Glenbrook Symphony Orchestra, jazz band, variety show, marching band and musical pit. Now he is touring as a drummer, agent and co-manager for Singer Bianca Muniz. On his journey to become a musician, Alumnus Michael Hojnacki (‘12) was told to find a backup career. While others criticized his interest in music as a career, Band Director Richard Chapman gave him advice that led him to continue pursuing his passion for music. “Mr. Chapman told me that there’s been countless people who have done music and have been able to make a living off of it, no matter the difficulties that came with it. “So, kind of after that point I decided, ‘Okay, I’m going to major in music, and I know it’s going to be a very difficult road ahead, but that’s what I’m choosing, and I’m not gonna back down from it,’” Hojnacki said. Hojnacki has been performing with Muniz since college. On Jan. 31, he brought the band to GBN to teach a master class to music students. The group performed songs and broke them down to explain how they were built. Students had the opportunity to play their own instruments alongside the group, and the class ended with a Q&A portion. Senior Julia Laughlin said the master class helped her see performance in college, including music and dance, as more worthwhile. “It’s cool to know that if I do that, [the arts are] not necessarily … a waste of time, or money or resources because that can actually pay off in the future,” Laughlin said. In addition to attending the master class, sophomore Diego Morales volunteered to play tuba for one of Muniz’s songs. He said this experience changed the way he thinks about the band directors in his life. Due to his involvement in different music programs throughout high school, Hojnacki said he is capable of playing different music genres and has found success when contributing to Muniz’s unique sound. “The way the arts department at GBN is … helped shape my mind, the way I think and write in certain circumstances,” Hojnacki said. According to Muniz, her music has changed and grown emotionally since she began her career because of her experience as a two-time cancer survivor. Laughlin said Muniz’s background made her music very inspirational. Muniz said aspiring artists should realize others’ opinions should not dictate their own choices. “Once you realize you can sing whatever you want, you can play whatever you want, you can write whatever you want, the sooner the better, because that’s when you’re going to find your true voice,” Muniz said. Hojnacki offered his own advice for high schoolers interested in music.